Although the manager did his best to rectify the situation, (he seemed to be the only one seriously knowledgeable about the menu) the damage was already done. He offered to take care of my meal and send me home with another order of veggie fajitas sans gluten and disappeared into the kitchen....BUT NOT BEFORE TELLING ME THAT THE CHIPS WERE NOT GLUTEN FREE EITHER!! (Seriously? I practically ate half a basket! Did that employee I'd talked to before dinner not know anything?!) Apparently they are made with both corn and WHEAT flour. I think my husband put it best when he said, " Who makes wheat corn chips?" The manager returned with my takeout, continued to reiterate how sorry he was, and told me next time (I can't even eat the chips and salsa, why would there be a next time?) to ask for him immediately in order to avoid confusion. He seemed genuine, but everyone at the table was upset that he seemed to be making it out to be my fault. Shabtai Gourmet is a Gluten Free Bakery line specializing in Gluten Free, Dairy Free, Lactose Free, Casein Free, Soy Free and Peanut Free Cakes and Cookies. YES!! FREE OF ALL THOSE THINGS!! So if you're a skeptic like me you're thinking "how in the world could this stuff be good, when it has nothing in it?". Oh but it is my friends, it is. 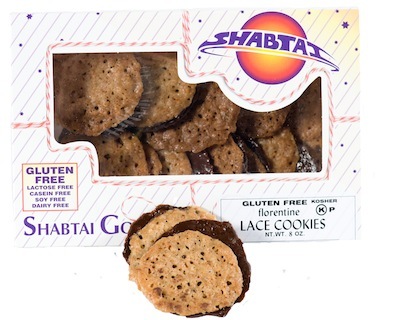 My first experience with Shabtai Gourmet products was at my Gluten-Free Friends group where I tried the Black & White cookie, a cookie so good it won top honors in my Who Stole the Gluten-Free Cookie from the Cookie Jar review. But there were still so many other delicious snacks to try and when my shipment came I thought, how in the world am I going to be able to eat all this. I must admit, it took some time (I haven't updated my blog since February! ), sharing and dinner parties to get through the five different items I had stuffed in my freezer (much to my husband's dismay). Hopefully it was worth the wait. First up the Raspberry Roll. When I first looked at it I thought, this is not something I would like the regular glutenous version of... but looks are deceiving. I served it to guests after dinner WITHOUT telling them that it was gluten free. My one friend, a man with an unbelievably big sweet tooth who mercilessly teases me about my gluten free-ness, devoured it in seconds exclaiming how delicious the combination of yellow cake, raspberry jam and coconut was. "Did you make this?" he asked with raised eyebrows. "Of course.....not. I don't bake, don't be ridiculous." I replied. 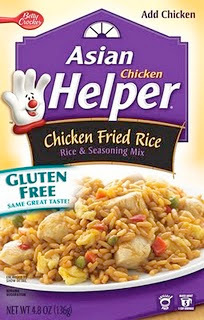 When I told him it was gluten-free he demanded to see the box and when I showed it to him, he was shocked. So I tried a slice and it was crazy good! I couldn't believe I liked it. But what did your mama always teach you? Never judge a book by it's cover. Next up were the Ring Tings. A completely decadent version of the classic Ding Dong and equally delicious. My husband looked at it precariously when I first served it to him, then asked me every night afterwards if I'd thawed some out for dessert. They disappeared quickly as did their swiss roll, think Little Debbie, counterparts and mostly by his hand (much to MY dismay). Then I tried the chocolate chip cookies. I hate to be a downer, but these definitely were not my favorite gluten-free, dairy-free chocolate chip cookies. There was far too much spice to them with an overwhelming cinnamon flavor, teeny tiny chocolate chips and a texture that just didn't do it for me. But have no fear for I have saved the best for last: The Florentine Lace Cookies. I CANNOT believe someone actually makes a gluten-free dairy-free version of this wonderful cookie and was just beside myself to once again eat them. They were AMAZING and hard to put down (remember gluten-free dairy-free does NOT mean calorie free my friends). I, and I'm sure you, am so grateful for a company like this that creates delicious allergen free products. Check them out in the freezer section of your local health food store or co-op. Disclosure: Although Shabtai Gourmet provided these treats at no cost to me, this product review was posted at my discretion and without bias. This review reflects my honest opinion. Some friends had invited us over for dinner one Friday night and we were really looking forward to it. They asked if we could bring a salad and some wine. But as we pulled up to their house at 6:00 on the dot we noticed something strange.... a Domino's Pizza car was pulling out of the drive way. "Oh no," my husband said, "Now don't get upset". But I was upset, my friends know I'm gluten-free. There must be some kind of explanation. "Maybe that's why they asked you to bring a salad," he smirked. "Ha ha," I retorted. We entered cautiously, me with an exaggerated smile plastered on my face, and immediately my friend said "Look what we got you!!". It was a beautiful and delicious looking gluten-free pizza from Mellow Mushroom. Guess we shouldn't have been so quick to judge. If you live in the Wilmington, NC area you are no doubt super excited, ecstatic and just plain beside yourself now that there are TWO, I repeat TWO, pizza parlors in our tiny little town that serve gluten-free pizza. But how do they taste? 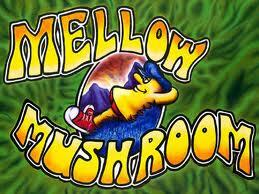 Well, my first experience with take out gluten-free pizza was indeed Mellow Mushroom and it was DElicous. My friend had ordered a white pizza with grilled chicken and sun dried tomatoes. The gluten-free crust reminded me of a rich whole wheat crust that I used to order from a gourmet pizza place in Vegas and I loved it! I felt like I was eating a real pizza. My second experience with a gluten-free take-out pizza was at Incredible Pizza at 1952 Eastwood Road. I specify the location because we seem to have a million Incredible Pizza's here, only two of which are actually related to each other. Incredible not only offers a gluten-free pizza but also has dairy-free options. But BEWARE: the dairy-free cheese there is not good. I could barely get past the look of it, much less the smell, but I did it for you guys. And even after disguising it with oregano and some red pepper flakes it was still tough to get down. All you dairy-free-ers out there, you just remember I took one for the team when I put that pizza in my mouth. As for the gluten-free crust, this version tastes more like the real thing. In fact this thinner, crisper version (unlike the softer, whole wheaty flavor of Mellow Mushroom's crust) is quite good. At this time the gluten-free pizza is offered in a personal size only. Another cool thing about Incredible is that all their pizzas are available to take and bake. Now if you live elsewhere, there a quite a few Pizza chains jumping on the gluten-free bandwagon including Godfather's Pizza (one of my favorite's in Vegas) and Uno Chicago Grill. Check out this review on Godfather's gluten-free pizza. There is also a fabulous gluten-free pizza available at Jules Thin Crust Pizza in Doylestown, PA. For a list of gluten-free pizza restaurants around the nation check out this page for more information, it was really helpful to me when I was visiting the flam in Jersey.